Correct Wheel Sizes, PCD, Offset, Rims and Tire specs for Maruti A-Star series. Hi,Lakshay,Can you explain your question? i have A star of 2009 year. but asper chart rim is 4j and on this rim 165mm tyre can not mount. 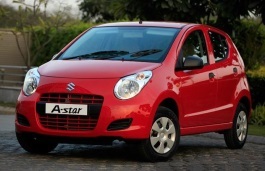 Maruti astar comes with 4.5j alloy. one could easily mount a 175/70R13 or even a 185/70r13 tires.